There are certain tasks listed below that clock owners can preform to ensure proper running and time keeping of their clock, of course there are always clock repairmen willing to do these tasks for a fee. How to Wind Your Clock? Most clock need to be wound once a week or daily. To do this, insert the key into the arbor protruding the dial and slowly turn the key in the clockwise direction or counterclockwise direction. When turned in the correct direction, the clock will produce a clicking sound indicating the correct winding direction. Continue to wind slowly until the key stops and you cannot turn it. Do not force beyond this point. If you have a striking clock, then there will be a second winding arbor protruding the dial. Repeat the same procedure for the strike noting that this winding arbor may need to be turned in a different direction. If your clock chimes at the quarter hour, then there will be a third winding arbor protruding the dial. Repeat the same procedure for the chime noting that this winding arbor may need to be turned in a different direction. A clock case can be physically level and the clock will not run because it is not in beat. Putting a clock in beat means setting the clock up to give an even tick and tock sound, which produces its most efficient running condition. To determine if the clock is in beat, start it and listen to the tick & tock as the case is slowly raised on one side and then the other; a wedge or shim placed under the side of the case works well. When the tick & tock is even or sounds about the same, the clock is in beat and will run the best. If your clock is in beat and the case is not level, a part on the clock called the “crutch” needs to be adjusted to fix this condition, and adjusting the crutch should be left to an experienced clock person or just let it run in an unleveled state. Also, the clock can be in beat and not run, meaning it needs service. How to Regulate the Time of Your Pendulum Clock? 1. Adjustment nut on the pendulum, if your clock has a small nut on the bottom or another place on of the pendulum, then use this method. To adjust the regulation, the pendulum rating nut must be turned, and the amount depends on how much time the clock is in error. If your clock is off less than five minutes a week, you may only need to turn the nut a revolution or less. If the clock is off more, you may need to turn it more. To accurately adjust the clock, make the adjustments once a week when the clock is wound. If you do this and keep a record of how much it is turned each week, you should be able to adjust the clock’s accuracy to within a minute or two a week. Use the following rules to adjust the PENDULUM NUT; If the clock is running slow, turn the pendulum nut clockwise to increase the rate. If the clock is running fast, turn the pendulum nut counterclockwise to decrease the rate. 2. Adjustment on the dial, if your clock has a small arbor protruding the dial near the “12” or the “6” or perhaps in the center of the dial, then use this method. You will need smaller key to turn the rating arbor. Some clocks will have a “S or F” by this arbor. For a ‘S-F’ mark, turn the arbor clockwise for faster and counter-clockwise for a slower rate. With a ‘F-S’ marking, adjust the arbor opposite as stated above. If there are no ‘S or F’ markings near the arbor, then use the trial and error method to determine the correction direction to make the time adjustment. Some times this adjustment can be turned too far; so do not force the adjustment if it tightens. Can a Clock Be Over Wound? If the winding procedure above is followed, then a clock in good operating condition cannot be over wound, there are probably other reasons it will not run. Many people have been told at some point in their life that a clock can be wound too tight, and that probably extends to a situations where a clock that is badly worn will not run when it is fully wound. So, if your clock has not been serviced in many years, and is fully wound, but will not run, then in all probability it needs service. How Often Should My Clock Be Cleaned and Oiled? Mechanical clocks in good operating conditions only need to be oiled each three to six years, depending on the environmental exposure or less often in a cleaner, cooler setting. Clocks should be cleaned each 8 to 10 years, again depending on the environment. If cleaning and oiling is not done on a regular basis, your clock will wear more rapidly and other more costly maintenance remedies will need to be preformed. How to Properly Move Your Grandfather Clock? It is important that the accessory components of the clock be handled correctly during the move. On clocks that have weights & pendulums with finished brass, use soft gloves or cloth when handling these components. Please read this entire move instruction before attempting the task. Remove the pendulum from the clock. If the clock has cable holding the weights, make a loose roll of newspaper about 2 inches in diameter and hold above the pulley as the weights are wound until they stop with the paper jammed above the pulleys. This procedure prevents the cable from tangling when the weights are removed. For clocks with chains, raise the weights so the clock is about half wound (middle of the clock). Use a piece of thin wire to string the chains together just where the chains protrude below the movement seat-board and tie the wire together; this action will secure the chains so they do not come off the movement. Also, secure the chains so that they do not damage the finish. Remove the weights and mark them so they can be replaced to the same position later. For tubular movements, remove the tubes, and note their position for installation later. 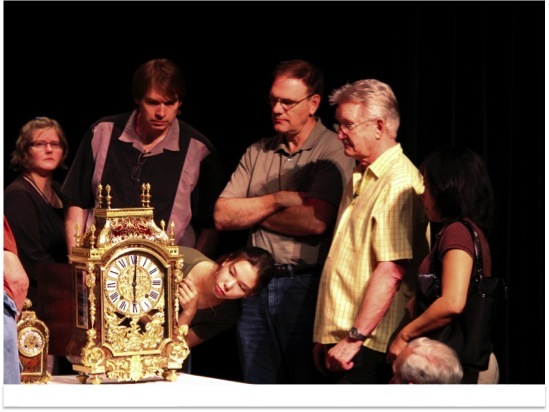 Before moving the clock, ensure that the movement is mounted securely in the case. On some early English and American clocks, the movement just sets on two sideboards of the case. For these conditions, the movement should be removed from the case and stored in a safe place before moving the clock. If the clock is to be moved to another room in the house, use a dolly or two-wheeled cart with blankets to protect the case finish. If the clock is to be moved to another location, the case should be professionally packed in a rigid container and each the movement, weights and pendulum packed in separate boxes. For clocks with chime rods, secure them from vibrating by wrapping cloth around the rods and secure it with string or rubber bands. Once moved, to set-up the clock in a new location, ensure that case will be positioned on a stable floor surface; carpets can be a problem if the case footing is not stable. The clock does not have to be absolutely perpendicular to the floor, but it needs to be stable and not rock. Some cases have leveling feet, or a small shim can to used to stabilize the case on the floor. If the movement is out of the case, replace it in the same position it was before. If the clock has tubular chimes install them now or if the clock has chime rods, remove the clothe from them. Attach the pendulum just as it was before and place the weights in the same position as they were before the move. If a wire was used to secure the chains, remove it. If paper was used to hold the cables tight, remove it or just let the clock run for a day or so and it will fall out. Simply start your pendulum swinging, and listen to the tick-tock sound. Raise the left or right side of the clock slightly with leveling feet or shims to get the tick-tock sound balanced. Your grandfather clock is now in beat and your move is complete. Wind the clock, set it to the correct time and enjoy it. If all this sounds too complicated, call your local clock shop and they will do it for you. I have inherited a granddaughter clock from my mother who died recently. The clock originally belonged to my grandfather, to whom it was presented in 1926. I do not know the exact age of the clock. It has beautiful Westminster chimes every quarter of an hour, increasing in duration to a full chime on the hour. My mother had the clock serviced just before her death almost a month ago. Unfortunately, I have been unabl to contact Cunnungham Jewellers in Lancaster, where the servicing was done. I would like someone to tell me how to go about packing and transporting this clock from my mother’s home in Bolton-le-Sands (Lancs) to my own home in the north of France, near Lille. Could you give me some advice, please? Would it be better to have the clock shipped professionally, or would it be easy to do myself. I have absolutely no idea how to handle such an old clock, I must add! I was given my grandfathers mantle clock and it needs repair. 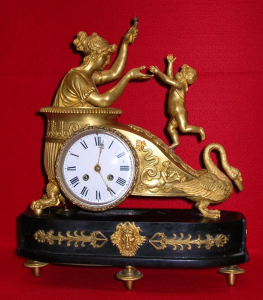 It is a Linden mantle clock made by Cuckoo clock mfg co inc New York. I know what is broken and I believe it is a simple fix if you can get the part. Is this something you can do ? When striking the hour the clock strikes the first strikes very fast and then slows down to finish. Any idea why? And how do I correct it please? Can the striker be made faster i.e. Less time for each strike for that hour! ?